The goal wasn’t necessarily to be the first. Just to be the best. But the way Hollywood Casino had it figured, to offer the best sports wagering in Pennsylvania, being first would be a great place to start. The local casino fully understood it was taking on an unfamiliar process, and that progress would sometimes be measured in baby steps. Sure there have been kinks to work out—obstacles to overcome—but there is little doubt that Hollywood Casino will get where it intends to go. Even though it’s been around for years, legalized sports betting is the new game in Harrisburg. It’s a concept that local players seem to be warming to, and one that Hollywood Casino is embracing. Gary Pecorello is Hollywood’s Director of Casino Marketing and the man charged with making local legalized sports betting work. 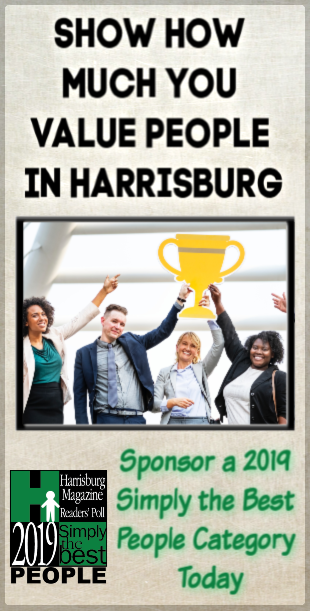 Given its place in Pennsylvania’s world of wagering, Hollywood Casino and sports betting are a natural fit, especially when one considers the slots, table games, sports bar, and of course horse racing, that the establishment already had in place. “I never made a bet on sports in my life,” says Pecorello. “When I was asked to lead the project, I had no experience in sports betting. I have 22 years of experience in customer service and horse racing. I had to educate myself on what’s important to consider for sports betting. It can be an intimidating experience for a customer if they’re not familiar with how sports betting works. The odds are different than those in horse racing. In May of 2018, sports betting in Pennsylvania became legal. Six months later, Hollywood Casino at Penn National Race Course began accepting wagers on just about every major sport. The venture—a cooperation between Hollywood Casino and William Hill, one of the United States’ leading sports books—is now about four months old. “We wanted to be the first sports book to open in Pennsylvania,” says Pecorello. “The first wager ever made here was $20 on the Pittsburgh Steelers to win the Super Bowl. We started hiring people and training people in October and it created 16 new jobs. William Hill provides the equipment and the odds, and sets the betting line. We accept wagers. Their expertise is on the betting side of things. Our expertise is customer service and providing facilities for wagering. 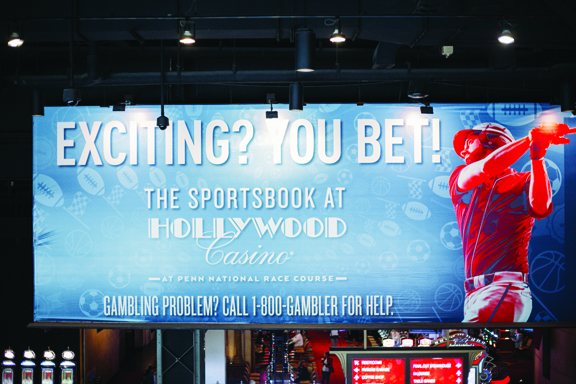 Six of Pennsylvania’s 12 casinos have followed Hollywood’s sports betting lead, but many of those wagering houses are located in the suburban Philadelphia region. A handful more Pennsylvania casinos are expected to institute sports betting in the near future. The cost for a sports betting license in Pennsylvania is $10 million. “We’ve seen business from extended locations,” says Pecorello. “Wilkes-Barre/Scranton, Easton, Allentown, central Pennsylvania, State College, Williamsport. The fact that we’re in the Harrisburg/Grantville area puts us in a central location. They’re all coming here. I don’t think those people would come here otherwise. We offer a product that some casinos don’t have. In January of 2019, at the height of the NFL playoffs and college football bowl season, Hollywood Casino handled just over $4.8 million in sports bets and realized $284,000 in gross revenue. That wagering generated $96,000 in state tax and another $5,600 in local taxes. While Hollywood Casino’s overall handle has shown a steady increase, the money it takes in is directly affected by the seasonal nature of sports. “In the past, customers were likely betting on sports on-line,” says Pecorello. “But having the convenience of being able to receive payment after the conclusion of the event is something they appreciate. Purchasing tickets for cash and then being paid in cash for their winnings is appealing. For Pennsylvania customers, an advantage is there’s a gaming tax for legal wagers. You would think those residents would see benefits from that tax revenue stream. At Hollywood Casino, players can wager on all the major sports—football, basketball, baseball, hockey, soccer and the Olympics—as well as some lesser publicized events like golf, tennis, rugby and lacrosse. Another advantage for betting at Hollywood is the array of wagers the casino offers—against the spread, money lines, over/unders, proposition bets, futures, parlays and even in-game bets. The minimum bet is two dollars, while the maximum must be approved by the casino’s management and officials from William Hill. “You name it, we’ll go for it,” says Pecorello. “Every single game and team has a betting line number. You simply go up to one of the sports book representatives and tell them the game and team you want, and state the size of the wager. The betting lines are set and the odds are set. Logistically speaking, Hollywood Casino’s new sports book has been incorporated with horse racing, in the former simulcast room, equipped with tens of televisions, ample seating and wagering tellers—just steps from the casino’s sports bar and Penn National’s live horse racing venue. Within the sports book/simulcast racing room, sporting events are featured on TVs along the front wall and simulcast racing is broadcasted in the back. “It’s close to the sports bar and we also felt there was going to be synergy with the horse racing,” says Pecorello. 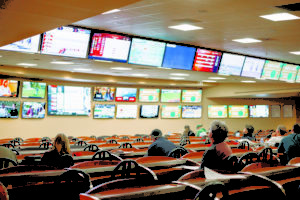 “It led us to believe the former simulcast room would be the best place for the sports book. As a customer, what’s important to me is that I have a fair wager. That I’m getting paid in a timely fashion. Now I can do it legally. I have an environment where I can do it fairly and enjoy it. It’s very much a part of an entire experience.